Is there a way in which a 'Read Only' User Account which is a member of a User Group with 'Read' access rights to several maps can have a rotating view of these maps? If the Account Type is changed to 'Read/Write' the 'Multi-Edit' option is available but the maps cannot be selected unless the User Group is given 'Write' access to the maps. I have seen KB-posts which suggest using Object Ids/Public Access Secret Keys or Get HTML URLs but wanted to confirm selecting multiple maps for Map Rotation was possible for 'Read Only' accounts in 'Read' access groups. the maps used for the map rotation are set to "Allow public access" in the map settings. We are running version PRTG Network Monitor 15.1.14.1778 x64. If the user account is set to a Read-Only account type the multi-edit is not available (check boxes are missing), that is regardless of whether the User Access Group the user is a member of is set to 'Read' or Write' rights for each map. The "Allow public access" is definitely set to Allow for each map. Please make sure that the User Group access rights of the desired user account are set to Read on each map. Afterwards, please login with the user account and navigate to Maps within PRTG's web interface or Enterprise Console. You should see each map, the specific User Group has read access rights to. By clicking on the small context menu in the upper right croner, you can select/start the map rotation. The screen shots you have provided are how we have set this user account up. 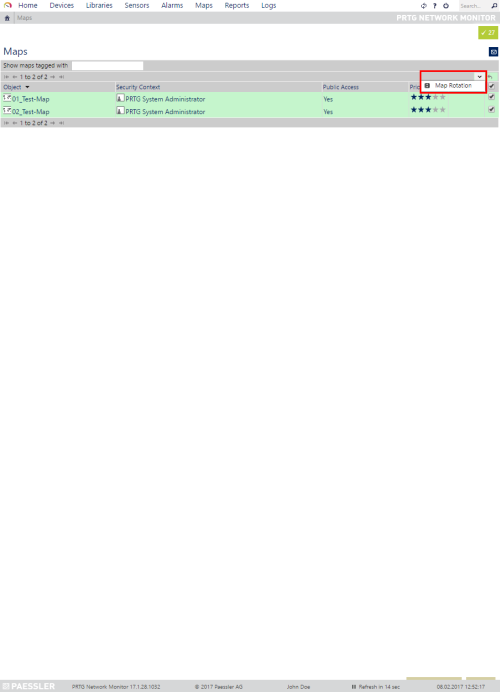 User account networkmonitor is set as a Read Only User and its Primary Group and only Group Membership is PRTG Monitor. 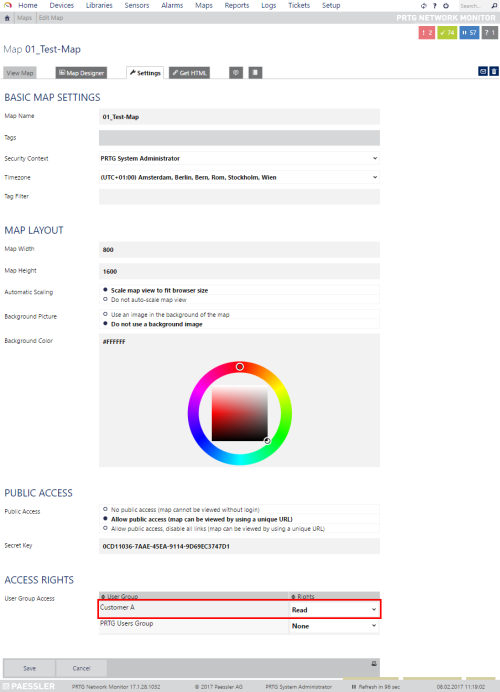 Group PRTG Monitor has Read access rights to each map and each map has Allow public access (map can be viewed by using a unique URL) selected. When logged in as user networkmonitor you can navigate to Maps->All see and click on each map to view but the small context menu is missing as are the radio buttons to select each map. If the user account networkmonitor is changed to a Read/Write User under Account Control the small context menu appears with the Map Rotation option but the radio buttons to select each map are still missing. If each map is changed to give group PRTG Monitor Write permissions under Access Rights, the radio buttons appear and then Map Rotation can be selected from the small context menu. 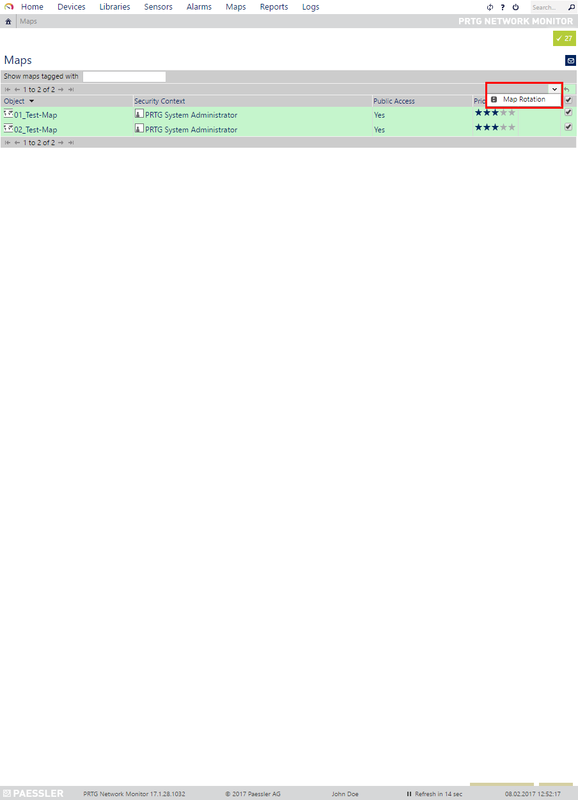 Any maps which are left with Read access under Access Rights for group PRTG Monitor, the radio buttons remain missing and cannot be selected. Thank you very much for your detailed explanation. From my point of view this looks good to me. Unfortunately, I am not able to tell if the described issue of your is a bug which has been fixed in the meantime. Kindly understand, that PRTG 15.1.14 is almost two years old and no longer supported. Please update PRTG to the very last version 17.1.28.1032 or download and install a Trial version of PRTG on a dedicated machine to check if you still encounter these issues.